I am a long time lurker and finally decided to join the ranks and purchase a baja project to occupy my time and money. Picked up this baja this afternoon and recognize many parts but need confirmation from you veterans. I took pictures and have a few questions in hopes I could get some help. I am new to baja VWs so explain terms and components with this in mind please. Vehicle is looking to be a daily driver weekdays and weekend desert runner/jumper for fun. Thank you in advance. Question #1- 1776cc engine and transmission (from a bus I am told). It has a Solex 34 PICT3 single barrel carb on it. If the motor is relatively stock is it in my best interest to purchase a larger carb to obtain more power or stick with the SOLEX as my engine is adequately matched to the current carb? If larger, name the optimum carb and size. Question #2- Bus transmission I am told. I see 3 ribs on the top and 3 mirrored on the bottom. Beyond this I see no other tell-tale marks to distinguish its type. Type? Worthwhile for romping in the desert? Picture #1,2,3- 3 electronic devices on upper firewall. I recognize 1 as a Crame Fireball XR700. Far left one bewilders me as does the far right one. Any ideas? Voltage regulator? Close up of both below. Picture #4,5,6,7,8,9- I see large IRS rear trailing arms that do not appear stock. Are these aftermarket ones or stock arms with some metal welded onto them to strengthen them? Anyone recognize brand and size based on these photos? Pictures #10, 11- Front end. King Pin front beam apparently. Stock or aftermarket? Measuring the towers from the top of the upper beam to the shock eyelet hole I get 12". Am I measuring correctly to ID this? Manufacturers mention 6" or 10". This refers to width beyond stock? How to I measure this on my front end? Stock trailing arms just beefed up with some gussets or aftermarket? Brand? Picture #12- Rack and pinion setup labeled as a WRIGHT. Quality component? Turns on a dime. Picture #13- 1/5" body lift it seems. Keep it or ditch it? It's in good condition it seems. Picture #14- 6 point roll cage with 2 shock mounts in back. Anyone recognize the shock brand or cage brand? Possible alteration of a CHIRCO 6 point cage? Its all welded and also welded to the pan. Question #3- Baja comes with 31x10.5x15 tires in back and P205/75/15 on front. Wanting more aggressive tall tires in front and rear. Based on the photos can anyone recommend the tallest/largest tire sizes the body can accommodate? Pan sits 12" off the ground in front 13" in rear. 1776cc engine. Thanks for the help and look forward to being part of the online AZBaja community. Looks like a good find. As far as carbs go, find your self a Dellorto 36 or 40, lots of improvement on performance. If you go with a 40 you can jet it down and change the venturi size if needed, and down the road if you build a bigger motor you wont have to buy a bigger carb. I am not a fan of dual carbs because of the simplicity of a single, twice the carbs, twice the possible problems and you have to keep them syncronized. A Dellorto is a 2 barrel carb anyway. The Motorola electronic is indeed a voltage regulator, which means you have an alternator, more output that the typical generator usually found on VWs. Small electronic box on the left looks like a tail light converter. VWs use separate lights in the rear for brake and turn signals, while american cars only use 1 bulb, the converter allows you to run the brake and turn off the same bulb. Box in the middle does look like an ignition box. Yes that is a 3 rib Bus trans, plenty strong for off road and a major improvement over a stock Bug trans. The rear arms look like stock boxed trailing arms. Front beam is an aftermarket widened beam, a stock beam is 34" wide end to end on just the beam itself, if you measure outside to outsie on the shock towers it will get a close enough measurement to tell the width of the beam. Looks like 8" travel towers. Keep the rack and pinion, good upgrade. Keep the body lift, more tire clearance for the bigger tires, and more room inside the car. a 31" tire on the rear will probably be your limit with stock rear arms. You could go as large as a 30x9.50 on the front. Check out treadwright.com they have retread offroad tires on the cheap and they are good quality with a warranty, I run them on my Fasty. Thanks for the information. I think I will pick up a Dellorto 40. I live in the valley and am looking at good gas mileage and some romping on the weekends. Could you recommend jetting and venturi size? Thank you. I will probably bring it into you in the next 2 weeks to do an overall tune up/eval. I imagine I will need a different type of linkage for the Dellorto. Can you get that? Cost? I am a long time lurker and finally decided to join the ranks and purchase a baja project to occupy my time and money. Welcome to our world! Although at no time in MY life have I ever needed to find something to occupy my time or money. I have forcefully shifted priorities at times though. Picked up this baja this afternoon and recognize many parts but need confirmation from you veterans. I took pictures and have a few questions in hopes I could get some help. I am new to baja VWs so explain terms and components with this in mind please. The engine may be from a Bus, but it's essentially a Type 1 engine, which busses used until they switched to Type 4 engines in the early 70s. In buying parts and doing repairs, keep in mind that this is a Type 1 engine. 1776 is a good engine size. Stock 69mm stroke crank with oversize 90.5mm cylinders and pistons make a 1776. The case and the heads where the cylinders fit in have been bored oversize to allow installation of these cylinders. You'll need to know that when/if you need parts or machine work. 92mm cylinders will slip right in as the engine is to make an 1835. This is an early bus IRS 68-73(?) gearbox (uses 4-joint axles with CV joints at inner and outer ends). Much stouter than an IRS Bug gearbox and the differential gear ratios are better for the bigger tires and offroad use. It is likely to get poorer gas mileage than with a T1 IRS though. But its a good thing. It has been adapted into the car, so axles and motor mounts may not exchange directly. The interior floor under the back seat may have a hole cut for the front of the gearbox and the shift linkage may have an adapter piece to connect it to the bus gearbox. These may present some issues, but all may be fine. The issues (if present) can be fixed without great difficulty or expense. Daryll is a good one to go to for that. Have him take a look when you go in. - Far left I agree with Daryll...tail light converter. These are available at places like WalMart automotive in with the towing stuff. Cost about $14 last I looked, in case it dies. - Middle is a Crane electronic ignition module. - Right box, silver with VW/Motorola is the voltage regulator for that particular alternator. This is an aftermarket Motorola brand replacement alternator. They are fine, good quality. Some Bosch alternators have a built-in regulator and don't use an external like this. Something for you to be aware of if you ever need to replace the alternator or regulator. CVs are Type 1 or Type 2/4. The inners are likely to be T2. The axles being painted white are perhaps Sway-A-Way aftermarket axles of a different length than stock bug or bus. Needs a rear skidplate to protect the trans and engine. And where the bumper is attached to the lower mounts appears loose. Pictures #10, 11- Front end. King Pin front beam apparently. Stock or aftermarket? Measuring the towers from the top of the upper beam to the shock eyelet hole I get 12". Am I measuring correctly to ID this? Yes you're measuring this right. The 12" to the top mount means that, as Daryll said, it has "8"" towers. I know, that's confusing...The 8" refers to the shock travel which fits on this beam if the stock arms are used with modified mounts with the shock mounts on the arms next to the lower link pin. Yours is like this and that setup gives 8" of wheel travel. Manufacturers mention 6" or 10". This refers to width beyond stock? How to I measure this on my front end? Stock trailing arms just beefed up with some gussets or aftermarket? Brand? Yes the 6" or 10" beam refers to width from one end of the tubes to the other end of the same tube. Measure from the end of the tube just inboard of the rubber grease seal where the arm goes into the beam tube to the same place on the other side of the car to find beam width. The front arms are stock with reinforcing ribs and modified mounts. This car could really use some reinforcing of the beam near the outer ends. Supports connecting to the cage would be very good. This beam as it is will be easier to bend than stock because it's wide and there is a lot of leverage when the wheel hits something. You may want to close up the hole for the stock steering column and maybe the gas tank opening, etc. especially if you're going to drive it on the street. Hooking up the heater ducts in back would be good to. I drive mine daily and these winter high desert mornings get downright unpleasant with sub-freezing air blowing in, puddles splashing in your face, foggy windows, etc. Dust and splashing water/mud wold be nice to keep out even offroad. With those heater ducts into the body open, just driving down a graded dirt road will choke you with dust coming out of the heat/defrost vents from aerodynamics. At least stuff a rag in there. This is the original offroad rack and pinion. Others are copies. As long as it's not sloppy, this is quite a good thing. the box is rebuildable. The steering shaft adaptation looks reasonably good. Picture #1 3- 1/5" body lift it seems. Keep it or ditch it? It's in good condition it seems. Actually looks like 2" lift looking at the square tubing. Keep it. We can't see the forward part of the cage to tell if its a Chirco/EMPI. The rear part visible is fine, but I suggest adding braces from the top of the hoop at the back of the door down to the rear by the firewall. The motor mount braces are good. The rear bumper mounting to the firewall is not good. It won't take much of a bump from the rear or dragging it in the desert to push it through the firewall. Mount it to the cage. And the pop-out rear 1/4 windows are nice for airflow, but the latches and hinges tend to not survive for long in an offroad car. Front tires don't really need to be a very aggressive tread. Nor do they need to be wide. 7.00-15 is a real popular size for the front. A lot of offroad racers use "highway tread" 7.00-15s. Many of those who use "Traction Tread" 7.00-15s have the outer corners of the tread lugs shaved off. An inexpensive 215-75-15 All Terrain (most any brand will work fine) is just fine and will work well for daily driver use as well. I have Yokohama 7.00-15s on my Baja that came on the Centerline wheels when I bought them. They are wearing out very fast in DD use. I will replace them as I recommended above. For the rears I would stick with the 31 x 10.50s unless/until you upgrade to 3x3 or bigger rear arms. Then/if, maybe go up to 33 x 9.50 or 10.50. MojaveRacer208- thank you for the help. I really appreciate it. AzBaja- Looking forward to getting this thing up and running and coming on some trail events. Welcome. looks like a good find. Picture #10 - Front end. ack it up, remove the pinch bolts top and bottom, and slip the wheel and spindle assembly out, pulling the link pins out of the arms. There are very thin washers on the linkpins called "shims". Make sure you remove all the shims from the arms, sometimes they stick to the grease. Wipe off the grease from the arms and place a straight edge on the end face of the lower arm and extending past the end of the upper arm. There should be a space between the straight edge and the end of the upper arm. Measure this in mm with a caliper. It should be between 5 and 9 mm. If you have less than 5mm, you probably have a bent arm or 2. There should be 10 shims on each linkpin, some against the arm inboard of the link bushing, and some under the head of the pin outboard of the link bushing. If you have 5mm difference, there should be 3 shims between the link and the arm at the top, and 7 at the bottom. The remainder of the 10 shims on each pin will be placed outboard of the link under the head of the pin. If you have 9mm of space, you should have 7 top and 3 bottom. Adjust the shim count in between 5mm and 9mm. Shims need to have a thin smear of grease on both sides before assembly. When you reassemble the spindle onto the arms, make sure the shim count is right 1st. Then once it's in, install the pinch bolts. They fit into the grooves on the pins. If the bolt won't go through the hole, take it out and look through. Turn the pin using a 14mm wrench on the inner end until you see the groove in the pin through the hole in the arm. Then install the lockwasher on the bolt but don't tighten all the way yet. When both top and bottom pins are in the arms with the pinch bolts installed, then turn each pin until the link snugs against the arm. Back off a hair. Then tighten the bolt on that arm. Then do the same with the other arm. Torque the bolts to 32 lb/ft. This tightening of the linkpins should be done often. After each offroad outing, check the adjustment by putting your foot against the outer bottom of the tire and grasping the top of the tire with both hands, then shaking the wheel and watching for movement between the arm and link carrier. If there is noticeable movement, do the snugging procedure described above. When doing this doesn't fix the movement, the linkpin bushings are worn out. Also watch for movement between the spindle and the link. Movement here will indicate worn kingpin bushings. If there is movement between the edge of the drum and the backing plate, the spindle bearings are loose. I will look into this. Thanks for the information. Looking to replace this blocky looking rear cage with something a little more stylish. I will have the new one mat up to the roll cage. The ugly gas filler there ont eh right needs to be replaced with one that is more flush. Anyone know where I can find one? Looking through you guy's vehicles I see some people using a clear type of tubing for a gas tube down into the fuel cell. What type of tubing is it and where can it be purchased? Got my eye on a single 40 Dellorto carb. Seems like a logical replacement to go on the 1776. The little tube to the top right in the photo actually goes at the bottom for a drain. Fuel spill/rain/etc. Hook a hose to go out the bottom of the body. One thing I dislike about the old bumper is the 1" tubes to the firewall. Mounting the new one to the cage is good. Another point is to start the bend from horizontal under the engine to vertical behind it, is to start the bend right at the back edge of the engine case. Bend up at 45 for about a foot to clear the exhaust, then bend the rest of the way to vertical or whatever angle you like. This makes for a lot more clearance in the back so the tail doesn't drag all the time. This photo is my rear bumper sitting on the driveway on its ends, but you can see the way the bottom part bends. Your old one and Tyler's (thext94) both turn 90* and go to straight vertical. But that style are inclined to drag. 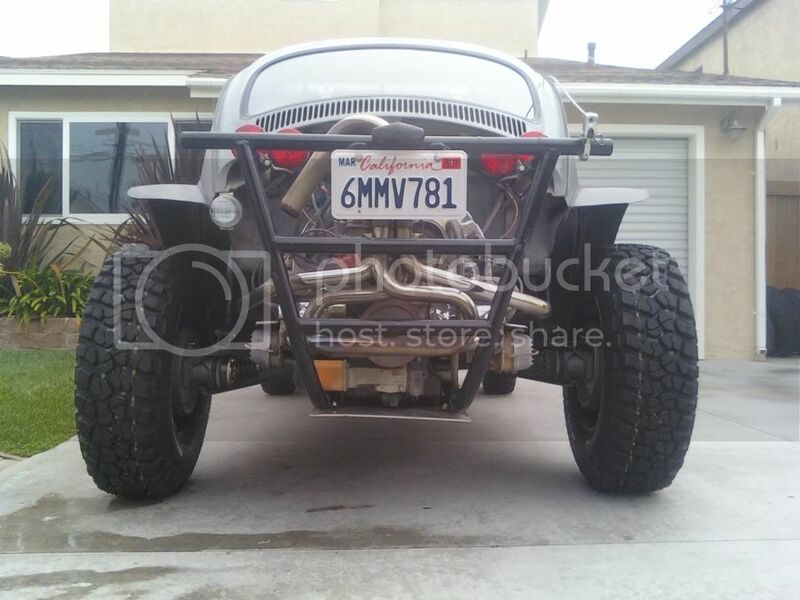 Here is another rear bumper idea for you. I like the flush mount lights, kinda cleans up the rear of the car. I ran the wires inside the tubing. I like the look of the cages that have bars not covering the top of the engine. The flush mount tail lights do look sharp. Looks clean. Worth running a metal panel across and cutting out for lights. Inner 2 are tail lights outer turn signals? MojaveRacer208 - I'm all over that gas inlet. Perfect, Thanks. 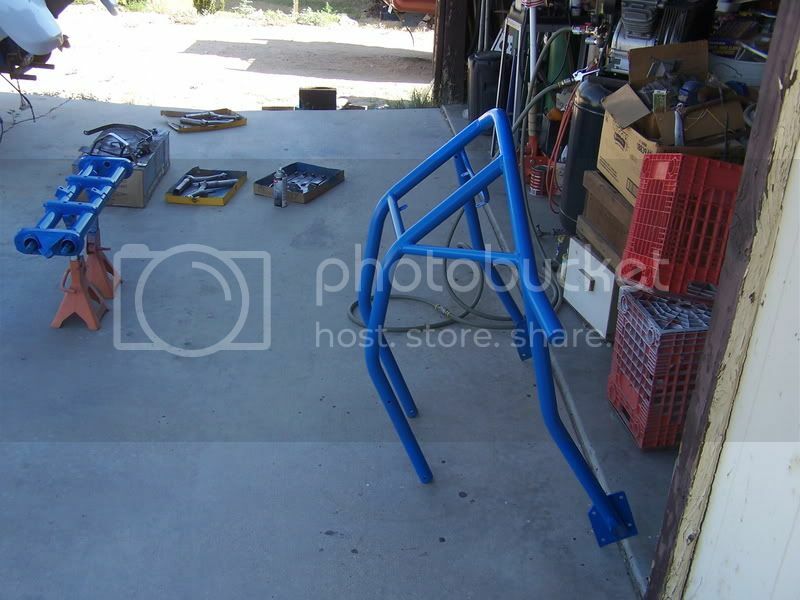 MojaveRacer208- do you have a picture of that blue cage on a baja? Looks promising. manufacturer compete, kit, or custom made? Replaced the spark plug wires and it fired right up. Drove it around the block and it died on me. Motor surges, sputters, and everything in-between. I need that Dellorto 40 and then take it down to Daryll to get it running better. Trying to hunt down a 40 and intake now. Do I need special linkage for a single Dellorto 40 or can I use what I have now?